As more adults head to the dermatologist, experts ponder the causes of this unwelcome condition. While possible contributors include pollution, today’s high stress levels, and newly developed prescription medications, an emerging body of research points to another culprit: the Western diet. But wait, haven’t doctors, textbooks, and health and beauty magazines been telling us for decades that the link between food and acne is merely a myth? That loading up on chocolate bars and fried foods will not result in a face full of zits? Although a famous 1969 study of chocolate’s effect on skin debunked any connection between food and skin problems, dermatologists may have dismissed diet’s impact on acne too quickly. Recent studies show that high-glycemic foods such as refined grains and processed sugars–the mainstays of a typical Western diet–may, in fact, trigger breakouts. Here’s the problem: High-glycemic fare such as french fries, breakfast cereal, white bread, and soda boost blood sugar too quickly–and the pancreas responds by making extra insulin to bring those sugar levels down. As an unintended consequence, the insulin also signals the sebaceous glands to manufacture and secrete sebum, the oil-like substance that’s carried to our pores via hair follicles. In proper quantities, sebum is a good thing; it flushes out dead cells and keeps your skin lubricated. But too much causes the bacterium P. acnes to over-propagate and jam up the hair follicle. The result? Whiteheads and blackheads on your forehead, chin, and cheeks. In addition, what Americans don’t eat may prove equally problematic for their skin. For instance, with 97 percent of our grain intake coming from processed rather than whole grains, we don’t get enough of the fiber, zinc, and vitamin B6 that can help curb acne. And the vast majority of US adults fail to get their daily allotment of fruits and vegetables–seven to nine servings–leading to a shortage of blemish-blocking vitamins and antioxidants. Overconsumption of omega-6 fatty acids from processed foods and vegetable oils, coupled with too little of the anti-inflammatory omega-3s found in salmon, walnuts, and flaxseeds, compounds the problem, since inflammation (already implicated in heart disease, diabetes, and prostate and breast cancers) may very well damage our largest organ, the skin, as well. On the bright side, making low-glycemic foods the heart of your diet may zap those zits once and for all. In a 2007 Australian study, researchers examined 43 male acne patients, giving one group a low-glycemic diet of whole grains, lean meat, and fish while keeping the control group on a regimen of high-carb, high-glycemic foods. After 12 weeks, the low-glycemic dieters had far fewer pimples than the control group. Frestedt didn’t need a study to convince her that dietary shifts can trigger or alleviate blemishes. Shortly before her acne struck, she became roommates with a woman who served buttery mashed potatoes, creamy pasta dishes, rich pastries, and fatty cuts of red meat. Although Frestedt tried to avoid eating these low-nutrient foods, she just couldn’t resist the homemade fettuccini Alfredo and piping-hot rhubarb pieï¿½and her skin suffered. Topical treatments failed to clear the blemishes, but less than two months after moving to her own place, Frestedt was back to her old eating habits. And after a couple of weeks of eating steamed veggies, lean turkey, and whole-grain bread again, she noticed that her oily, irritated skin had begun to clear. Before you declare war on ginger snaps and mac n cheese, know that food affects everyone differently–some people are wired to react more severely to acne-promoting foods than others. For instance, Patricia Janner, 54, drinks two cans of cola every day, frequently feasts on fried foods, and can’t remember the last time a pimple popped up on her face. (Of course, she’s hardly the epitome of health, even with good skin karma.) Meanwhile, Robert Heilmann, 35, says he maintains “a fairly healthy diet,” yet zits sprout on his nose and forehead on a regular basis. “Not all acne patients are the same,” says Treloar. To determine which foods spell trouble for your skin, Richard Fried, MD, dermatologist and author of Healing Adult Acne (New Harbinger, 2005), recommends keeping track of what you eat in a food log. “Take note of certain foods or types of food you ate four to 24 hours before an acne flare-up,” he says. See how your skin reacts to specific foods and eliminate anything that causes problems. Refined grains. Because they are so highly processed, the majority of cereals, breads, and other flour-based foods that we love to eat lack the nutrients, namely zinc, and antioxidants our skin needs to combat acne. Refined sugars. Candy, soda, pastries, and cookies can be particularly troublesome for those prone to acne. These indulgences spike blood sugar levels, which your body tries to bring down by producing more insulin and male hormones. 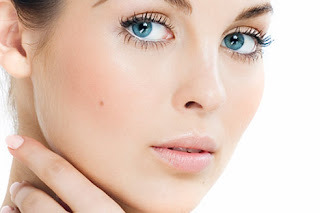 In turn, these hormones prompt the sebaceous glands to work overtime, resulting in blocked pores and inflammation. Milk. “If there’s one thing you should remove from your diet if you want clear skin, it’s milk,” says Alan Logan, ND, coauthor of The Clear Skin Diet. Although relatively low on the glycemic index, milk carries a heavy hormone load–even organic milk contains hormones because all milk comes from nursing cows. These hormones, along with a high percentage of calcium, has made milk a suspected acne trigger for decades. Dermatologists believe milk accelerates the body’s synthesis of androgens, male hormones present in both men and women, which causes the sebaceous glands to crank out excess sebum. You can avoid milk’s blemish-inducing effects without skimping on calcium by switching to calcium-fortified soy milk and other nondairy milks and eating plenty of spinach, collard greens, and tofu. Vegetable oils. Corn, sunflower, safflower, and sesame oils have far more omega-6 fatty acids than anti-inflammatory omega-3s. This imbalance promotes inflammation, which causes skin cells to clump together and jam pores. 1. Whole grains. When it comes to thwarting acne-causing inflammation, fiber-packed whole grains work like a charm. “Whole grains carry a lot of antioxidants,” says Logan. “They also stabilize blood sugar and prevent insulin spikes.” But be careful when perusing grocery store aisles for whole-grain items–crafty label lingo can make a loaf of bread or box of pasta seem like a healthy choice, when in reality it carries only a small percentage of whole grains. Logan advises checking a product’s nutrition info to make sure it’s high in fiber and low in sugar. Even better: Forget wheat and give ancient grains like quinoa and millet a try. 2. Fish. Heralded as the premiere source of omega-3 fatty acids, cold-water, oily fish are loaded with anti-inflammatory eicosapentaenoic acid (EPA) and docosahexaenoic acid (DHA). The Clear Skin Diet lauds oily fish such as mackerel, salmon, anchovies, and sardines as the most potent choices for blemish-free skin. 3. Green vegetables. Packed with inflammation-fighting nutrients and loads of antioxidants, most green leafy veggies contain plenty of fiber, which helps slow the rise of blood sugar after eating. 4. Purple and deep red foods. According to The Clear Skin Diet, foods containing anthocyanins are high in antioxidants and help maintain blood flow to the skin, promoting optimum cell turnover (essential for keeping pores clear). Acai, pomegranates, purple carrots, black grapes, and beets are all great choices.